WHO’S STILL STANDING? Accident On the Set! Based on an Israeli series “Still Standing”, the import to America, renamed “Who’s Still Standing” started filming on the Sunset Gower lot in Hollywood this week. So far, not such smooth sailing for this game show that plunges contestants with wrong answers to trivia questions through trap doors in the floor. The game consists of one main player who chooses one of the other 10 contestants to play head-to-head in a trivia stand-off. The contestant who answers the question incorrectly is dropped through the trap door. The game continues until one player is left standing. The grand prize is $1 million. The main contestant gets three chances at answering questions. So, he or she may make three “passes”. Similar to “Let’s Make a Deal”, on this particular show day, contestants were dressed in costume-type outfits. One looked like an astronaut, another one – cheerleader. During today’s morning tapping of the show, a contestant who was going for $55,000 answered a trivia question incorrectly. He was supposed to fall through his trap door. However, three other contestants’ doors opened instead to drop them. His door did not open. According to one eye-witness, it was a “mechanical” error that they stopped the show to try and fix. Host of the show, Ben Bailey stated, “don’t worry…everyone’s okay”. Soon after, the studio audience was released for lunch. The show was expected to be picked-up in the afternoon show that was scheduled to start at 4pm. Instead, audiences were turned away by crew who stated that there was something wrong with a contestant and production canceled the show. Filming is scheduled to resume Monday. 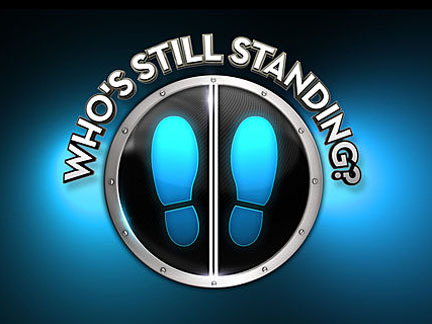 More “Who’s Still Standing” news to come. Will the show continue taping again? I really wanna see this show air! Suprising that NBC hasn’t scheduled it yet, especially with all the holes in their schedule! Shooting is scheduled to pick back up Monday – June 6th.